Do you want to send or transport a cheap vehicle? Have you bought a vehicle but do not know how to bring it to your home? Do you need to send a vehicle to the buyer who is far away? 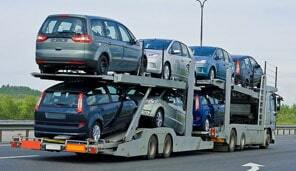 Buying a vehicle from another country and bringing it to your home today is easy thanks to the auctions of loads. In our bag of loads you have the category transport of vehicles where you can find companies of transport of vehicles of all ranges and dimensions with cranes, platforms trailers and special vehicles to be able to take your car to the desired destination.Find and search a transporter with vehicle special to load and carry cars on your loading platform and also to make the route that interests you can be a rather complicated task and lose a lot of time.Thanks to the transport bag this task is done in much less time to be offers of loads online where carriers are looking for job offers let’s say the ads of car transfer that you are publishing you are looking for a way in a route and date defined.In our pages you will find easily offers for cheap, professional vehicles with tow car carrier trailer. Publish your vehicle that you want to bring it or send it on our web of auctions of transport of vehicles or you will get the best price thanks to the reverse auctions or carrier offers. Nothing easier than publishing the data of the vehicle you have to send or transport and our portal will make your ad will be seen by the carriers that are on the same route and will offer you the best price.Sending a vehicle today is faster and cheaper thanks to our contact system between advertisers and carriers.Professional transporters with towing platform trailer ready to send or bring your car anywhere.Publish now your ad free and carriers will offer better price. How to get transport or send a car cheaply? Publish your vehicle or car you want to bring it or send it on our website of car transport auctions and transporters and professionals will see your ad and bid and offer you the best price thanks to reverse auctions or direct offers from professional carriers for your ad.Send a vehicle today is faster and cheaper thanks to our system of contacts between advertisers and carriers through the bag of cargos.Professional transporters with trailer platform car ready to send or bring your car anywhere are ready with their services. Search free on our website of transport of cars and cheap vehicles all the available transport offers in all europe.Now transporting a fast and cheap cars is possible to do it with companies specialized in sending cars and that are at your disposal for 24h.No look for more car transport companies and ask the price of each company, leave an announcement of what you need to transport or send and they will be looking for you and offer their prices,so you win a lot of time and you could select the logistics company you need and it fits better for you.Online tool for transporting cars in cheap domestic and international cranes are available in many routes at a low price.